Mermaids have yet to be officially announced as "real," but what about sirens? Could there really be soul-sucking sea monsters lurking in the lakes, oceans and seas? Although real sirens have not really been found either, it is fun to think about their existence! 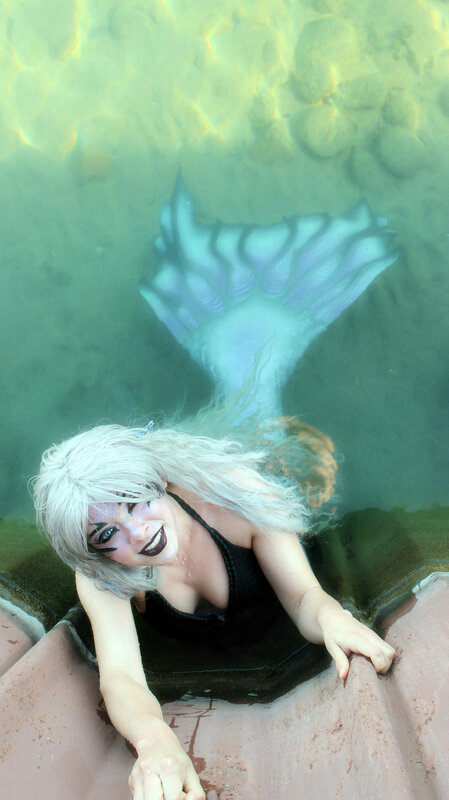 Movies such as "Pirates of the Caribbean," and "Sinbad" have brought up the concept of evil mermaid-like sirens before, and the recent TV series, "Siren," has reignited the spark of interest on the topic of sirens. While they are fun to watch on the big screen, thankfully these vampire-like merms aren't real, since that would make swimming a bit of a nightmare. Real Siren Videos: Proof of Sea Monsters or a Hoax? As you may or may not know, I post a lot of "Real Mermaid Videos," and "Real Siren Videos." Heck, I even post fairy sighting videos! But if sirens, mermaids and fairies aren't really real, then why do I post such things? Well... I have a few answers to that question. First, it's what I like to do! Video creation is my art-form! And second... I never wanted to be the normal, short, visually impaired Caucasian woman that I am. No. I always wanted to be a dragon. Like... for real! Hahaha! I actually was convinced that I could find some magical way to transform myself into a "Fire Clan Dragon." Or a lion. I was fine with settling for a lion too. How does this relate to my videos and my choice to become a Professional Mermaid? Simple. There's one thing I love more than almost anything else in life... proving people wrong. In this case, I proved myself wrong by making my eventually-conceived assumption that I'd always be a boring short girl null and void. I make my videos, create my crazy makeup looks and do my work as a Professional Mermaid to show my younger self that I can, in fact, be more than just another blade of grass in the yard of life. Obviously, I do this to entertain others too, but a lot of what I do does stem from my desire to say "see, you were wrong!" to my old self. Don't get me wrong... I do NOT consider myself to be a mermaid or siren (or any other type of fairytale creature) by DNA. No. I am a human in a costume on a mission to create a sense of awe in others with my videos and performances and to teach and inspire those who watch my videos to go after their dreams as well... no matter how strange. And as my extremely exotic makeup shows, I am a very free-spirited individual who expresses her emotions and creates her art on her face. I'm very much into "being yourself," and hope that by being my (sometimes spooky) self I can give others the courage to do the same. One of the reasons I love dressing like I'm demonic (aside from how powerful it makes me feel), is because it gives me the chance to show those that come across me that things aren't always as they appear. I think it is the most beautiful thing when a person comes across my creepiness and still makes an effort to start a conversation. OR! When people give me the look of disgust and I am given the blessed opportunity to be sugar-sweet and show them that I'm not some devil-worshiper. And... I just gravitate toward Gothic things. I CAN'T HELP IT! So... why am I writing this random blog post? I don't know. Really! I mean, the main reason I decided to write it (if I'm gonna be 100% transparent here) was so that I could pin the pictures you see in this post to Pinterest. However... the blog post ended up getting really weird and self-reflective? Not exactly what I had in mind for a sunny Friday afternoon! Bwahaha! Remember to be yourself, not matter what that looks like to you, and always be kind to those you encounter... even when you look like a beastly sea-demon.